Do Mil-Mil Exchanges With the Chinese Do More Harm than Good? 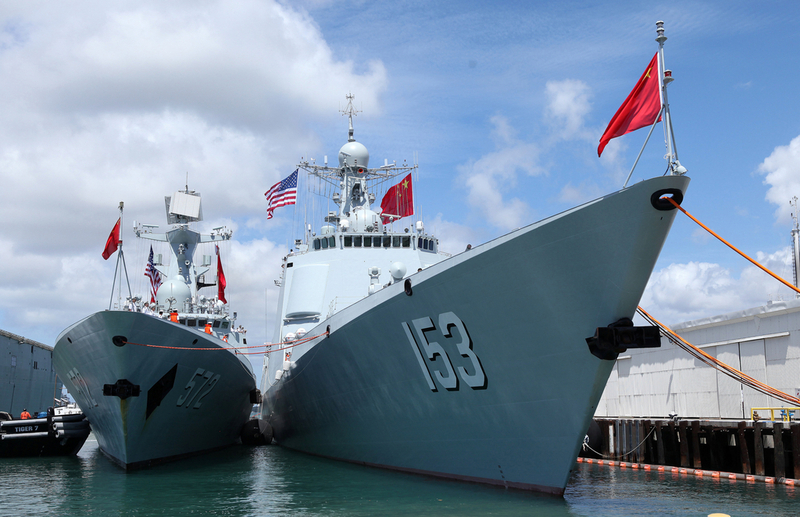 The PLAN destroyer Xi'an berths in Pearl Harbor to take part in the June 2016 RIMPAC exercises. I passed most days in isolation, clipping and evaluating Chinese military articles. It was interesting and meaningful work, but also a bit tedious. So when there was an opportunity to get away from my desk and socialize, I always jumped at it. As a result, I got to meet quite a few of China’s “barbarian handlers,” the English-speaking generals, intelligence officers, and state scholars Beijing uses to shape elite opinion around the world. At the time, Chinese delegations visited Washington regularly for military-to-military dialogues, some of which CNA hosted. These were supposed to be trust-building exercises. However, as far as I could tell, not much trust was ever built. Quite the opposite. Those Chinese generals I met seemed to regard Americans with a coldness bordering on hatred. It was startling, but I wasn't there to make friends. My mission was to learn more about how they saw the world. As an analyst, I viewed it as my job to figure out what made them tick. It was one thing to read what they wrote, quite another to meet them in person and hear what they had to say and watch how they acted. The delegations were always vehement on Taiwan. It was more than apparent that China, or at least the cadres in the Chinese Communist Party, had an obsession. After watching one Chinese official after another argue full-throatily about his nation's “core interest” in subjugating Taiwan, I began to see why the island's government thought it prudent to hold yearly air raid drills. One of these exchanges was particularly unpleasant. We threw a banquet-style dinner, and I found myself sitting at a table with three Chinese generals, who evidently spoke no English, and a friendly American naval officer, who spoke German, but not Chinese. Very little of substance was said during the course of the meal, and it was awkward. The American naval officer kept trying to make polite conversation with the Chinese generals, using me as the interpreter, but he was getting nowhere. They were rude and hostile. Finally, in desperation, the officer said, “You know, I was in the Pentagon on 9/11, and lost friends that day. If nothing else, our two militaries can agree that terrorism is a common threat to us both. We can cooperate and work together to prevent similar tragedies from happening in the future.” I translated this for the Chinese. In reply, a scrawny political officer, who the other two generals were visibly afraid of, said that the United States deserved to be attacked by terrorists on 9/11. Why? For the grave sin of interfering in other’s internal affairs. “That’s what you get,” he sneered. He was a power lifter, and the veins on his thick neck began to bulge out. Luckily for the Chinese, it was announced just then that the banquet was over. The general, no doubt sensing he had gone too far, abruptly stood up and scurried away. Before another word could be said, he joined others at the door and rushed out to board an awaiting bus. Few words were exchanged between us Americans as we got up and left the table. It felt like we had just extended an olive branch only to have seen it spit on. Easton’s story is hardly unique. To pick one example, I have found no group in the United States government more implacably hostile to the People’s Republic than PACOM officers forced to endure the PLA’s participation in RIMPAC. From a Chinese perspective it is almost a wonder that they go at all. I can only conclude that the intelligence they gather must be especially precious if it is valued above the incredible ill-will their presence there generates. Shifting attitudes towards mainland Chinese among the people of Taiwan is the same story writ large. The surging tide of anti-mainland opinion began, surprisingly enough, with the surge in cross-strait activities that followed the 2008 opening up between the two countries. So often familiarly does not breed sympathy, but contempt. This is a fatal flaw in any peace program (e.g., those outlined by Lyle Goldstein) that hope to use ‘exchanges’ as stepping stones to a more durable peace. Ian Easton, The China Invasion Threat: Taiwan's Defense and American Strategy in East Asia (Washington DC: Project 2049 Institute, 2017), 9-10.